If you’re pressed for time, this is a quick dessert to put together that will wow your friends. Normally I love making the short crust pastry base and caramel sauce from scratch but time is precious especially when you are cooking a great amount of dishes. I’ve made this amazing sweet chocolate caramel tart a couple of times and it does not disappoint! 1. Roll the pastry mix out onto a lightly floured surface to the thickness of a £1 coin. Press the pastry into the tin and trim & neaten the edges. Fill any gaps of the pastry with any excess pastry so its all covered! Put in the fridge for 30 mins – 1 hour. 2. Preheat the oven to 200C. Cover the pastry with parchment paper and fill with baking rice or beans and bake the pastry ‘blind’ for 15 minutes. 3. Remove the parchment paper and the rice and bake for an extra 5-7 minutes or until the pastry is cooked through and turning golden! Leave to cool in the tin. 4. Pour the caramel onto the base and spread evenly. Leave in the fridge to set while making the chocolate filling. 5. Pour the double cream and Vanilla into a small saucepan and heat gently, stir occasionally. 6. In a separate large bowl add the chocolates, and unsalted butter. Once the cream is just starting to boil, pour the cream over the chocolate/butter mix, and whisk till smooth. If the chocolate doesn’t fully melt, microwave the mixture in 10 second bursts till it does. Pour this on top of the caramel and spread evenly. 7. Refrigerate for at least 4 hours to set the tart, or even over night. 8. 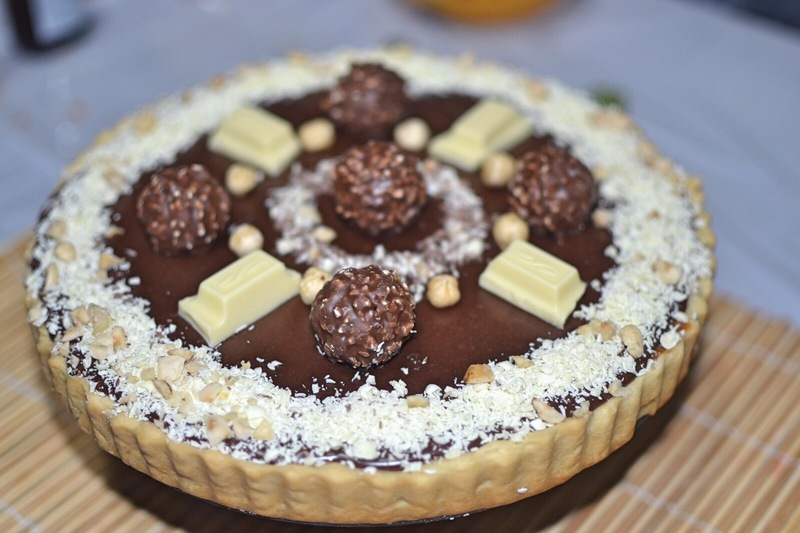 To decorate the tart, use a grater to make the white and milk chocolate shavings. 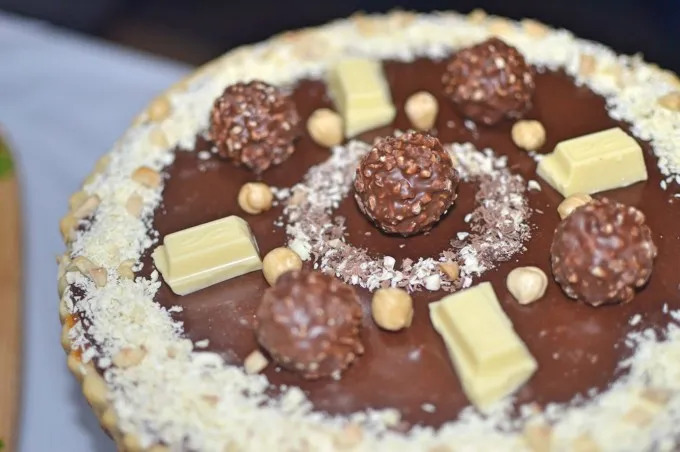 Add ferrero rochers, chocolate shavings, hazelnuts and enjoy!